In this comparison, we will be reviewing two of the most unique mattress brands that have recently entered the market. Tuft & Needle has made itself famous by introducing an extremely low cost mattress back in 2012. They have started a wave of other low-cost mattress producers entering the market to try and compete for market share. Many people don’t realize it, but foam mattresses are no longer an unaffordable luxury – you’re able to get one at an extremely low cost. Helix is another one of these low-cost providers, and they’ve been able to tap into their own niche by offering increased levels of customization that aren’t available with many other competitors. This comparison will do its best to provide you with all the details you need to fully understand each mattress and how they differ from one another. Make sure to compile a list of certain items that you consider absolute necessities – it’s a good idea to have a general idea of what type of mattress you’re looking for prior to beginning your research. As mentioned previously, one of the major selling points that Helix has is the added customization that they offer their customers. There aren’t any other foam mattress providers that offer this level of mattress customization for the price bracket that Helix is able to offer. Instead of choosing between a variety of mattresses, you actually take an online survey which takes into account all of your preferences and decides what the best mattress design for you is. You can access this survey online directly through their website – make sure to think hard about your answers, it’s the best way to ensure that Helix can make the perfect mattress for you. Your mattress will come with a 10-year warranty and a 100-day money back guarantee. All Helix mattresses are constructed right here in the United States – you’ll never have to wait too long for your delivery! As you can probably tell, Helix mattresses will vary depending on how you fill out the survey. But for the most part Helix mattresses consist of four different layers. Theses layers have different intensities and thicknesses depending on the mattress you end up requesting. We will overview each layer and its purpose in more detail below. This layer is made from responsive poly foam – this means that it has a bit more bounce than your traditional memory foam. It’s a great material because it allows for Helix to add more breathability to their mattresses – heat retention is a major complaint with a lot of foam mattresses. This is a layer that also provides comfort for those sleeping on it – it is composed of micro-coils – this is one of the reasons that many people refer to the Helix mattress as a hybrid. This is the last layer of the mattress as well as one of the most important components. It provides all the support for the entire mattress. This layer allows the top layers to provide as much comfort as possible. Remember, the thickness of each of these layers will depend entirely on the type of mattress you order. No two mattresses are alike, so it’s important to realize your survey will determine the exact construction of your mattress. The Helix cover is not nearly as creative as the mattress itself – but that’s sometimes the best way to approach it. You don’t want a mattress cover that ends up retaining heat, it would mean that the heat dissipation efforts were worthless. The Helix cover is made using a single source of material – the entire thing is made from polyester, meaning that you don’t get much variation in terms of differences between the top and sides of the mattress. The cover is in place for protection – it’s thin nature dictates that it doesn’t have an overbearing impact on the mattress itself. 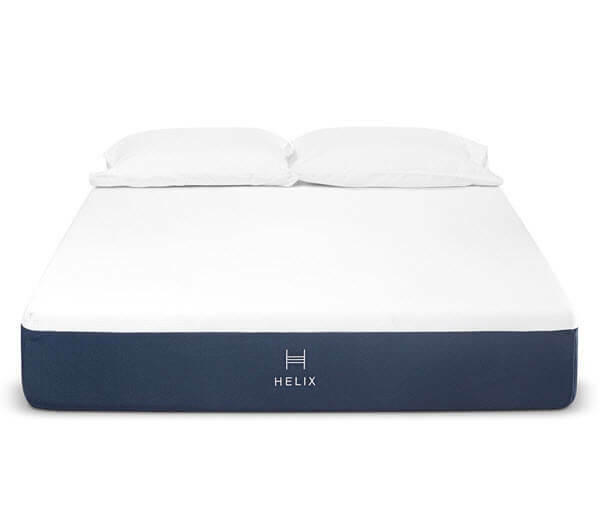 There’s no doubting that the Helix mattress is extremely comfortable – it has a longstanding reputation for being one of the most comfy mattresses on the market. Many people enjoy that it doesn’t use memory foam on the top layer of the mattress as it can sometimes retain too much heat and create too much of a hug around the body. The exact comfort and support that you will receive from the Helix will depend entirely on the type of mattress you end up ordering. That’s what is so unique about the Helix – you won’t ever find someone else with the exact same mattress as you. The Helix scores between a 3/10 and 9/10 depending on what you prioritize in your survey. Temperature Regulation – This is how much you value keeping cool throughout the night, some people struggle more to sleep when a mattress retains heat than others. Point Elasticity – This will dictate how much hug or contour the mattress has around your body – people’s preferences in this category vary widely. This is the least firm of the mattresses we mention, although there are even softer mattresses available should you want one. This mattress comes in at a 5/10 – it’s perfect for those who want a really soft mattress that doesn’t sacrifice too much support. This type of mattress scores at around a 6/10. This is best for those who are not heavy sleepers but still desire a bit more support – it can help you fix bad sleeping habits, such as lying on your stomach. This comes in at a 5.5/10 in terms of support. It’s good for those who are not heavy and enjoy a normal weight distribution. It won’t create too much pressure on your back and has the perfect level of contour and hug. This is the most dense of the options available. It uses more support foam than the others to create a mattress that is as supportive as possible. 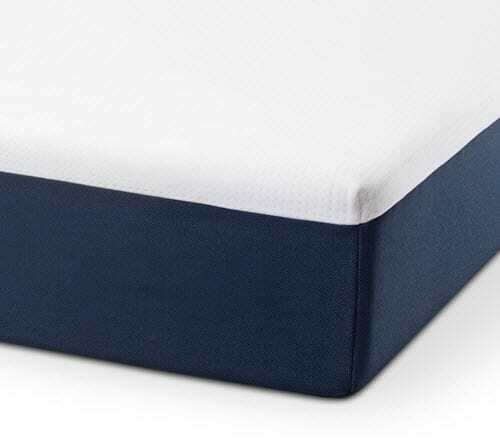 This is perfect for those who enjoy a supportive mattress or are heavy sleepers. 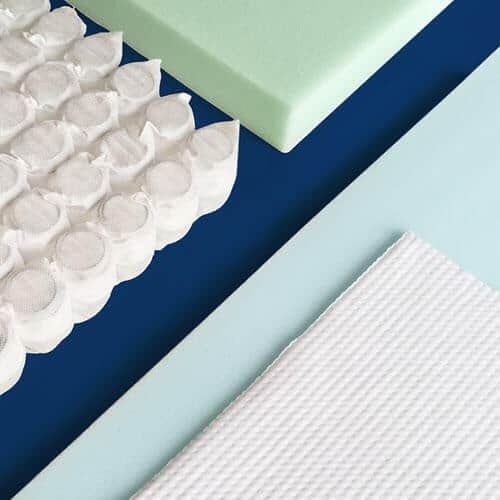 Tuft & Needle provides the cheapest foam mattresses on the market – they’re a great option if you want a high-quality product but don’t have a large budget. The company was started five years ago in Phoenix, Arizona and has grown rapidly. All mattresses come with a 10-year warranty and a 100-day money back guarantee. You can get the mattress shipped directly to your home for free anywhere in the United States – you can get free same-day delivery if you live in Phoenix, Arizona. There is also a showroom in Phoenix in which you can view mattresses if you want to. The Tuft & Needle mattress design is rather simple, they use two layers to make up a comfortable and practical mattress. We will explore each of these two layers in further detail below. This is a thick 4” layer of advanced poly-foam. This is much larger than many other top layer and it does well to provide a mixture of comfort and heat dissipation. This is the support layer – it is 7” thick. This layer is made up of highly-dense foam that provides the needed firmness for the base of the mattress. Just like the mattress itself, the mattress cover is extremely basic. The idea is to allow the cover no to interfere with the mattress itself. This is the reason it is extremely thin. Another plus side is that it is extremely easy to wash. It also ensures that the mattress doesn’t retain too much heat – the thicker your mattress, the more heat it will retain. After reading the above information you may feel like the Tuft & Needle mattress seems a little bit basic. While this may seem true, the comfort and support the mattress provides is undeniable. The reason the company has been so successful is because they offer a truly top-end product. We have done extensive testing on this mattress and have determined that the support of the Tuft & Needle ranks at about a 6.5/10. This is a really great level of support for those who don’t weigh too much. If you think you are the type of person who wants a comfortable mattress, but you don’t want to sink into it, the Tuft & Needle mattress is probably the best one for you. Remember, this mattress is also really breathable so you won’t have to worry about overheating if you end up being someone who finds it hard to sleep in warmer conditions. There’s simply no doubt that Tuft & Needle provide the cheapest mattresses on the market. You won’t find another foam mattress of this quality in the same price bracket. A full list of prices is provided below, keep in mind you don’t have to pay for shipping either. While you may already have a good idea of which mattress you prefer, it’s still important to be able to see all the relevant information in one spot. That’s why we’ve taken all the smaller details of this review and placed them into a table that is easy-to-read. Have a look at the table below if you want to see all the information side-by-side. There is no denying that the best value on the market is the Tuft & Needle mattress, but this doesn’t mean it’s the right one for you. If you are a particularly heavy or light sleeper, you might find that the mattress isn’t suitable for you. The great thing about the Helix is that no matter what your preference, you are likely to be able to find a mattress that suits you – and it is still a truly affordable mattress. If you have a partner that has different preferences to you, you can split the mattress down the middle so that you don’t have to compromise on a certain type of mattress. Both mattress types come with extensive warranties that provide plenty of assurances that your mattress will last long into the future. In addition, the simple designs of the covers make them easy to wash – both these mattresses are extremely low maintenance to maintain. 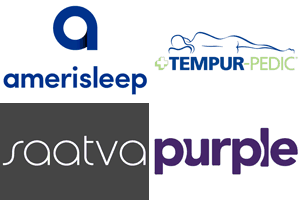 Make sure to check out some of the other mattresses available on our website – we have an extensive review database that you should check out before making a decision.